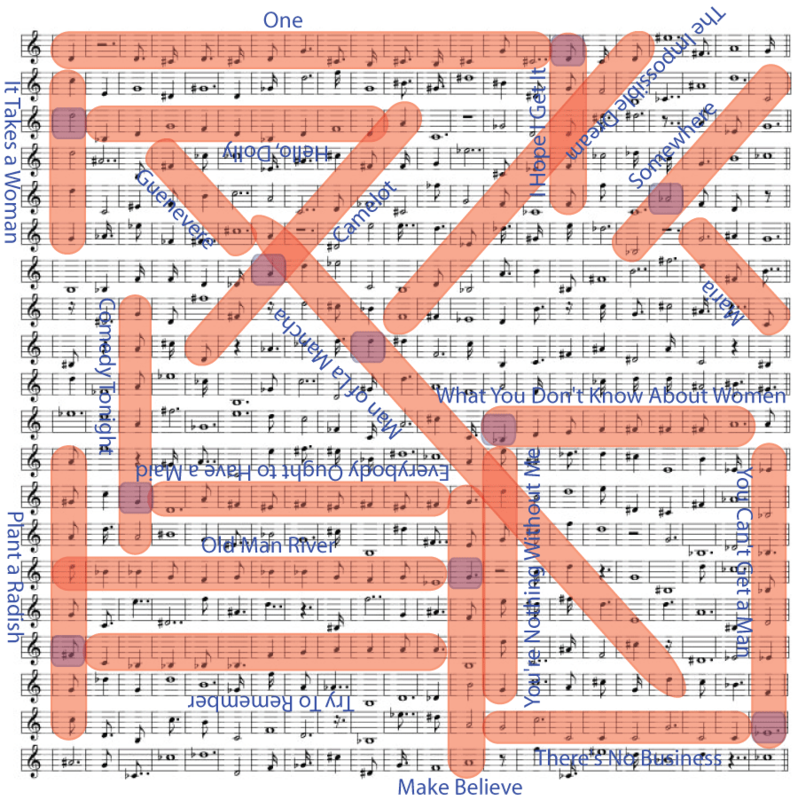 The grid contains twenty refrains from showtunes, each clued by one of the clue phrases below; the enumerations give the number of notes in the song that can be found in the grid. The songs in the left and right column can be paired off by what show they appear in; the melodies of the paired songs form T-shaped patterns in the grid. (Hence "Two for Tea"). The first column is always the (suitably rotated) horizontal bar of the T and the second column the vertical bar. Looking at the vertex of each T picks out a unique syllable from the phrase in the first column. In order from top to bottom of the grid, these syllables can be entered in the set of blanks below the grid and spell out IT TAKES A LOT OF WHAT TO MAKE A GUN. This is a quote from the musical Assassins, where the word WHAT needs to be replaced by MEN. The answer is MEN. Below are the completed grid and the list of songs.